The 2017 winners of the Bake Off designed a web-based app for Victoria Legal Aid that allows clients to answer questions and input information while waiting to see a Duty Lawyer. From left: Jessy Xie, Byron White, Rachel Hovenden and Joseph O’Neill. Over the course of a semester, the students have worked in the Law Apps course with non-profit legal-service organisations to create applications that help Australian citizens address legal challenges. The students built the apps using the AI software-development technology of Neota Logic. Students will unveil their creations at Thursday’s Bake Off event before a panel of judges, who will evaluate the apps based on a variety of criteria including innovation, user experience and effectiveness. While designing and building their apps over the semester, students have learned how technology in general can be used to solve real-world problems in the legal sector. For law student Annabel Tresise, the course has shown how technology can help improve access to justice for people in need. “Millions of people need legal help but don’t know how to get it or can’t afford it. So it’s very exciting to apply technology to help meet that need,” Ms Tresise said. Course instructor Cazalet added that the course receives support from technology provider Neota Logic and the law firm Slater and Gordon. Neota Logic’s Managing Director of Asia Pacific Julian Uebergang said: “It’s exciting to see how law students apply Neota Logic’s technology to address legal and business issues in novel ways. Slater and Gordon General Manager (Personal Injury Law Victoria) Dina Tutungi, who will be judging the finished products, said she was looking forward to seeing what the students had developed. “It’s amazing to see what aspiring lawyers are able to do to help everyone receive fair and equal access to the law, paving the way for further development in the years and decades to come,” Ms Tutungi said. 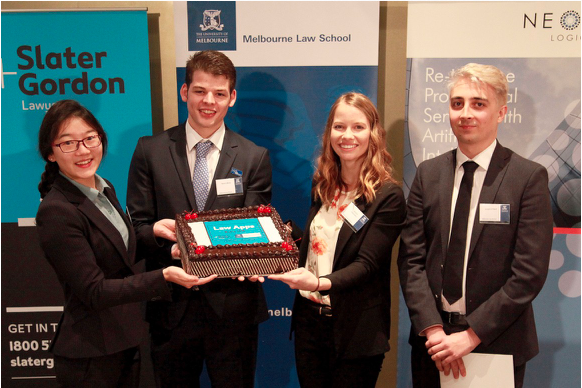 The Bake Off competition takes place at Melbourne Law School from 6-8pm on Thursday 25 May, with the winners to be awarded the Slater and Gordon Bake Off Award for the Best All Round Law App.